Infibeam has lined up the best of refrigerators that one can find online. Experience the comfort of online shopping and buy refrigerators online and get them delivered to your place within the stipulated time. These refrigerators are extremely durable and would last for long. They have refrigerator from reputed brands such as LG, Godrej, Whirlpool and etc...Innovation no more remains the same. Due to which gadgets change every single day as the manufacturers make more and more advanced electronic gadget. There are different kinds of refrigerators that are available on Infibeam. 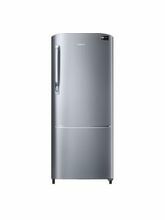 These are categorized as double door refrigerator, frost free refrigerator, single door refrigerator, multi door and five star refrigerator. These refrigerators are available at the best price. The refrigerator price in India fluctuates regularly and such fluctuations are common in India. Since there are more and more people looking for the best refrigerators here, the makers of such refrigerators have been increasing the price exponentially according to the demands of the consumers. These refrigerators have been classified In addition to being reasonably priced, these refrigerators have been offered at a discounted rate. The competent three door refrigerator has many amazing features such as 6 sense Active­Fresh and also has features such as airbooster that controls the circulation of air since each compartment receives precise cooling that it requires. It also includes MIcroBlock active that blocks all the bacteria and filters other such microorganisms and provides lifelong protection against contamination. Save your time and save your money by not visiting the store and taking the benefit of virtual purchase. When websites make these online purchases available, it's easy to zoom into any product and look into its features and decide. Since you have the liberty of time to decide the refrigerator you wish to purchase, you can lounge back and decide on the purchase you would like to make as opposed to purchasing it from a store, where one would be influenced by the opinions of the sale executives and other influencing factors. These refrigerators come with one year of manufacturer and added nine months of warranty on the compressor. The refrigerators are available in different colors and also differ in the features that they offer. Ranging from the basic type, it includes the advanced and sophisticated features that make a convenient living. It also includes the famous Panasonic frost­free refrigerator that works on an intelligent eco- sensor technology which helps you save power and also offers flexible level of adjustment for optimal cooling.